Given iOS 7’s major visual overhaul last year, it wouldn’t have been surprising if Apple decided to take a step back and focus on small under-the-hood improvements in iOS 8. But that didn’t happen: iOS 8 looks like it’ll be every bit the game-changer that its predecessor was. But this time, the focus is on system features and app improvements more than visual tweaks. In particular, the impending update will see a seismic foundational shift in the way apps communicate with each other, opening the door to a richer, more colorful experience for all Apple’s mobile users. Make no mistake: There’s a lot of new stuff in iOS 8. Here’s what we know about it so far. The wait’s nearly over. On September 17, you’ll be able to download iOS 8 for free, and install it on all your compatible devices—more on which below. Essentially everything from the iPhone 4s onward: The iPhone 4 won’t run iOS 8, but the iPad 2—and its technological twin, the iPad mini without a Retina display—will. iOS 8 will also run on the fifth-generation iPod touch. So what’s new in iOS 8? How much time do you have? There will be new photo features, big changes in Messages, predictive typing, the first major update to the iOS keyboard, iCloud and iTunes improvements, support for health apps and home automation, an improved version of Spotlight, and much, much more. And then there are Apple’s Continuity features, which will mate the Mac and iOS devices in a whole bunch of interesting ways. OK, so explain: What’s this Continuity? Continuity will connect your work across multiple devices with little to no effort on your part. That will include things like: seamless file transfers using AirDrop across Macs and iOS; accessing files from iCloud Drive from any device; answering phone calls coming into your iPhone on your Mac; sending SMS messages from an iPad or Mac; starting an email on one device and finishing it on another; and more. Apple previewed Continuity’s feature set using its own built-in applications, but it looks as though third-party apps will be able to build in support for some of the features, such as Handoff. Start an email on your Mac, finish it on your phone (or vice versa), thanks to Handoff. Wait, wait—iCloud Drive? Does iOS 8 finally get a file system? 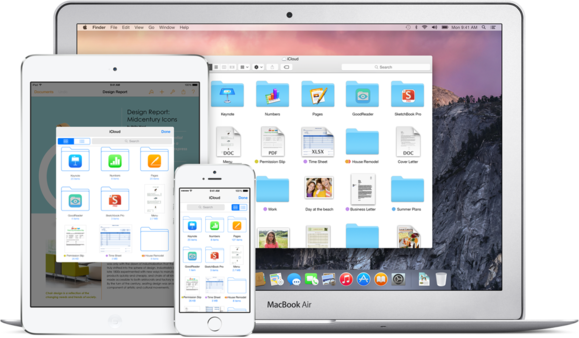 Another feature that will span multiple devices, iCloud Drive is a central storage locker for your documents and projects from various apps on both iOS and OS X. You can find out more about it in our iCloud FAQ. But to answer your question, yes, it does mean that iOS 8 will have access to files and not just from within the apps that created them. The Document Picker—as Apple has dubbed the new interface—looks a lot like a traditional Open dialog box on the Mac, right down to the search field and (from what we’ve seen) the ability to toggle between icon and list views. While files will be grouped by the application that created them in by default, Apple says you’ll also be able to create your own folders and organize your documents any way that you see fit. In OS X and Windows (yep, we said Windows), you’ll be able to simply drag files into the iCloud folder to sync them between your devices, à la Dropbox. Auto-correct has been part of the iPhone since the beginning, in part to because our big fat fingers kept mistyping messages from the phone’s on-screen keyboard. But now auto-correct is getting a much-needed retooling. QuickType is iOS 8’s auto-correct successor, adding a word-selector atop your iOS keyboard for quicker conversations. The service will not only recognize the difference between chatting in Messages and writing in Mail, it will provide slightly different suggestions depending on who you’re communicating with as well. When you type in iOS 8, QuickType will attempt to predict the words you want to use next, offering suggestions that aren’t defined just by the letters you’re typing, but also by the conversational context. The service will not only recognize the difference between chatting in Messages and writing in Mail, it will provide slightly different suggestions depending on who you’re communicating with as well. QuickType will learn your habits the more you type, but will keep that data confidential and stored locally on your device, so you won’t have to worry about your keystrokes being accidentally (or maliciously) revealed to the world. I heard that interactive notifications made the move to iOS. True? Yup! OS X Mavericks brought the notion of Quick Reply and interactive buttons to notifications on the desktop; now iOS 8 is bringing that idea to the mobile realm. You’ll be able to pull down banner alerts to quickly reply to texts or email, accept calendar notifications, or snooze reminders—without having to open the requisite app. This should even work with third-party apps if they’ve enabled the feature; at the WWDC keynote, we saw a demo of a Facebook notification with a Like button and Comment feature. iCloud Drive: Yep, there’s a file browser coming to iOS. What’s that row of people I saw in the demo of the new multitasking screen? When you double-press the Home button (or use a gesture on the iPad) to open the multitasking interface, a new row of icons will appear atop your recently-used apps: avatars of people you’ve recently communicated with; if you scroll to the right, you’ll get your Favorites list. From there, if you tap one of those photos, you’ll get quick access to buttons to call, message, or FaceTime that person. What’s this about a new and improved Spotlight? Though OS X Yosemite is getting the biggest improvements in its search tools, iOS 8 is getting its fair share, too. Now, when you search in Spotlight, you’ll be able to access inline Wikipedia information; news; Maps data for nearby places; results from Apple’s iTunes, iBooks, and App Stores; suggested websites for your query; and movie showtimes—all in addition to the contacts, email, messages, apps, and music that already appear in search results. The same engine will be built into the new Safari’s toolbar, too, so you can choose to do searches there instead. Are there any improvements to Siri? Apple’s virtual assistant got only a short nod in the keynote, but there are a few cool new improvements coming in iOS 8. For one thing, Siri promises to become even more responsive. When your phone’s plugged in, you’ll be able to get Siri’s attention without even pressing the Home button: Just yell, “Hey, Siri,” followed by your command, and the phone will come to attention. If you’re thinking this will eat up battery life, don’t worry: the device needs to be plugged in. Even if your device isn’t charging, though, you’ll still be able to access some of Siri’s other tricks: It will now recognize words as you say them, rather than waiting until you’ve completed your sentence; and you’ll be able to use Shazam technology to have Siri listen to and identify music (and buy that song from iTunes if you’re so inclined). 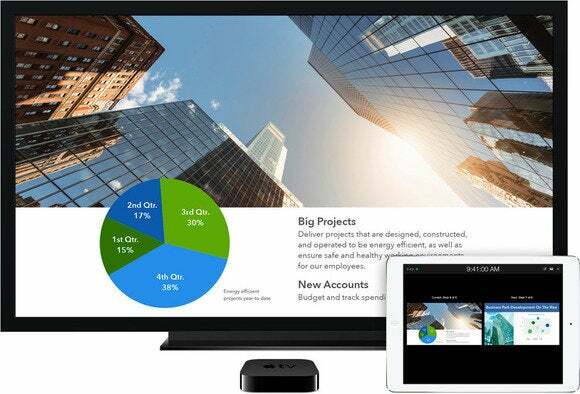 Those who use the Apple TV as a presentation device (or a good way to share slideshows at your friend’s house) will be excited about iOS 8’s peer-to-peer AirPlay discovery/playback service, which will let you AirPlay video and mirror your device’s display to an Apple TV without connecting to a Wi-Fi network. It’s a neat way to share projects, photos, or video without fussing with network passwords. You’ll be able to mirror your iPhone’s screen on an Apple TV without connecting to a Wi-Fi network. What’s Family Sharing? Is it multi-user? Family Sharing will also allow families to share family photo albums, calendars, and even the locations of themselves and their devices. Alas, Family Sharing won’t provide user accounts or profiles, a feature many parents have been hoping for since the first iPad. Apple still seems content with assuming that “multiple users” means “one iOS device per person.” But even though Family Sharing won’t help us better share a single device between multiple family members, at least we won’t have to buy multiple copies of an app or tune—or all share a single “Purchasing Apple Stuff” account. 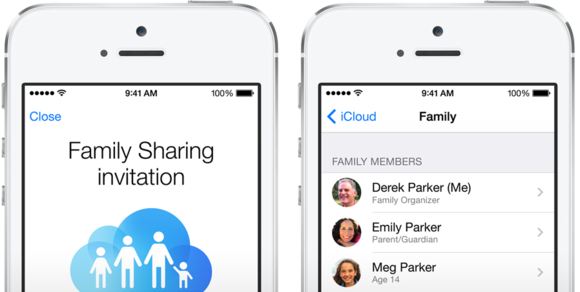 Family Sharing means up to six family members will be able to share the same iTunes content (and more). I heard there were some new Photos features? Yup! It’s almost like folks at Apple saw our Photos wishlist. The Photos app is getting an overhaul that combines iPhoto for iOS’s editing tools with a fully-functioning cloud-storage locker for your images. For starters, any photo you take and store in the Photos app will be automatically uploaded to iCloud, where your images and video are stored at full resolution and in their original formats (JPG, PNG, Raw, you name it). All of those images will be viewable on any iOS device or on the Web; starting in early 2015, you’ll be able to upload and view photos from your Mac, too. And the storage is going to be dirt-cheap: You get 5GB for free as part of your iCloud account; you can buy an extra 20GB of storage space for just $1 a month, and 200GB for $4. Having all those images at hand might make you nervous about ever finding anything again, but luckily, Apple is adding a smart search feature and a Favorites button. The search field will initially prompt you with a collection of nearby photos, images taken at the same time last year (for nostalgia factor), and all-time favorites; but you can also search by date or time, location, or album name. There will also be new editing features for images: Download an image to your device, and you’ll be able to use a bevy of iPhoto-inspired features to crop, straighten, remove red eye, adjust lighting and contrast, and more. All of those edits sync across your devices, so that the fixed image appears in your library immediately. They’ll also be non-destructive: if you decide you preferred your image unfiltered, you’ll be able to revert it. On top of that, iOS’s new Actions options for developers means that your favorite third-party apps could provide filters and adjustments that you could use from within the Photos app. Edit a photo on your phone, and those changes will instantly propagate to your other devices. What about the Camera app? Apple didn’t talk about it much on-stage, but the Camera app is getting its own fair share of improvements. Focus and exposure are now two separate controls and third-party developers will have full access to those settings. In addition, two new time-based features make their debut in Camera: a self-timer and time-lapse videos. The latter lets you record a video and then automatically creates a time-lapse from the data you’ve recorded, while the former gives you more flexibility when trying to take selfies with your back camera. What’s new in Safari and Mail? Glad you asked. Mail is getting some more gestures, for starters. You’ll be able to swipe left or right on a message in your inbox to mark it read or unread, flag it for followup, or swipe it all the way off the screen to delete it. While you could already mark contacts as VIPs (a feature added in iOS 6), Mail in iOS 8 will let you slap a VIP label on individual message threads. (Shouldn’t that be VIT?) That way, you’ll always stay on top of new replies to that thread, no matter who they come from. Exchange users will be able to set their out-of-office auto-replies from within the Mail app in iOS 8, too. Mail in iOS 8 will get some new contextual power. While composing a message, you’ll be able to swipe it down to minimize it, giving you access to other messages in your inbox in case you need to copy and paste something into your new email. And if you type something into an email that should go on your calendar, like a dinner reservation, Mail will toss up a notification that you can tap to add to your calendar. Start surfing the Web on one device, finish the same browsing session on another. Safari on iPad will get a cool new tab view that shows you all the tabs you have open and groups tabs from the same website into stacks. When you’re browsing, a sidebar will be able to pop out on the left for your Reading List, bookmarks, and Shared Links (which work like RSS subscriptions), to further align Safari on iPad and the Mac.